You might want to try out Bing Downloader if you are a huge fan of the Microsoft search engine Bing, or enjoy looking at the wallpapers that get posted as background images every day. 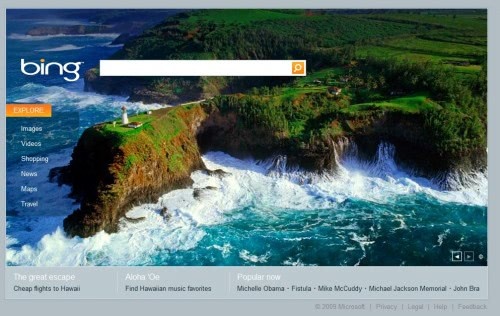 Microsoft has made the deliberate decision to add a background image to their search engine by default. Most likely to look different than their greatest foe Google Search. Some users have expressed the desire to download these background images to use them on their computer systems. It is possible to download the Bing background image manually. How it is done depends on the web browser used. Firefox users can for example simply right-click on the image, and select View Background Image to view the image in a new tab from where it can be saved to the computer system. Bing Downloader has been designed to automate the process. All it does is to display and download the latest Bing background image. There are no advanced options available like downloading previous background images. All the user needs to do is to run it once per day to download that day's background image to the computer. The background images usually have a size of 958x512 which makes the images not suitable as wallpapers for computer systems with large computer monitors, unless the user decides to center the wallpaper. Bing Downloader is a free 10K download. It requires the Microsoft .net Framework 3.5. Update: Bing seems to use different background images as can be verified at the Bing Image Archive. Update 2: The latest update supports multiple localized Bing search pages, including Germany, China and UK among others. This basically means that users can now download more images each day using the software.